PRETTY LITTLE RED CORVETTE READY FOR THE ROAD WITH UPGRADED 4-WHEEL DISC BRAKES. 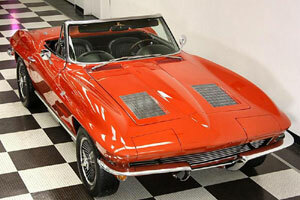 A 1963 bright red Corvette Roadster with 4-speed transmission and nice Black interior. 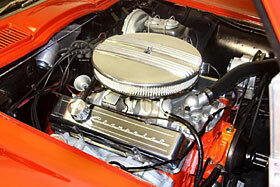 This was the first year Chevrolet introduced the hide away head lamps and all new midyear body styling. The car has very nice older red paint that has held up well over the years. 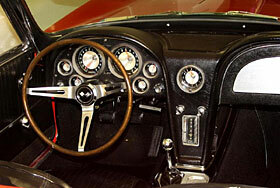 The black interior is also nice as you can see by the pictures. The car has been upgraded with Kelsey Hayes style KNOCK OFF spinner aluminum wheels. These sell for over $2500 for the wheels alone and make this a fantastic looking roadster. The body of the car is in great condition with very nice panel fit on the doors lights and hood. The frame and suspension are all original and very solid and clean. The bumpers were recently re-chromed and the car has a new gas lid. A great looking interior has new carpet, new arm rests and new sun visors with factory simulated wood steering wheel, the original Delco AM/FM radio and an actual working clock! There is a great running 283 ci engine and a smooth shifting Muncie 4-speed transmission power this little baby down the road. The brakes have been up dated with a power dual master cylinder and 4 wheel disk brakes.